I picked this one up solely on the strength of that cover. Just look at it! So much fun. Main character Cameron is a cosplayer and sewist who dreams of getting into CalTech with her costume portfolio. After a recent win for her costume at a Con, however, she's being harassed online by male comic fans (quelle surprise). Her family has just moved so she now has a summer without friends or responsibilities to sew up a storm. However, she encounters sexism in real life as she heads into the new-to-her local comic shop and is mansplained by the guy working there. She vows not to go back, but since she shortly after gets an order for a costume she needs to return to do some research. On her twin brother Cooper's suggestion she dresses up like a boy to head back, and magically everything is now peachy keen. She begins to get drawn into the comic shop's world when they begin a D&D game, and she's accepted as one of the boys. 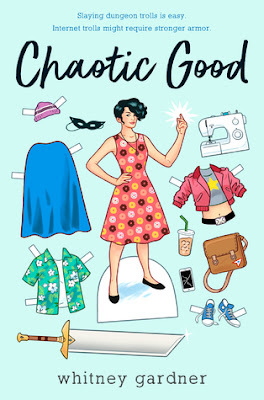 There's romance, humour, ambition, family dynamics, and lots of sewing in this book, all reasons I really enjoyed it. The story is fast paced, creative and super entertaining for anyone with geeky interests like comics, D&D, or sewing! I am so clueless about D&D that I had no idea the title referred to the game until halfway through the book. So it was definitely more the sewing aspect that appealed to me at the start. But otherwise, there was a great mix of diverse characters in this book, some wonderful older characters (like Lincoln's gran), and lots to think about in the storyline. This would make a great group read for teens. I'm counting this book toward the Canadian Book Challenge since the author, though being from New York, now lives in BC with her family. This book goes very well alongside Susan Juby's The Fashion Committee, which is focused more exclusively on fashion & sewing but is also about teen ambition and drama, laced with humour and pathos. This sounds like a good choice for you, especially since you sew.